PVH Employee of the Month Dakota Imboden is pictured at center, along with Terry Lucas, coordinator of Cardio-Respiratory Services, and Glen Washington, FACHE, PVH CEO. 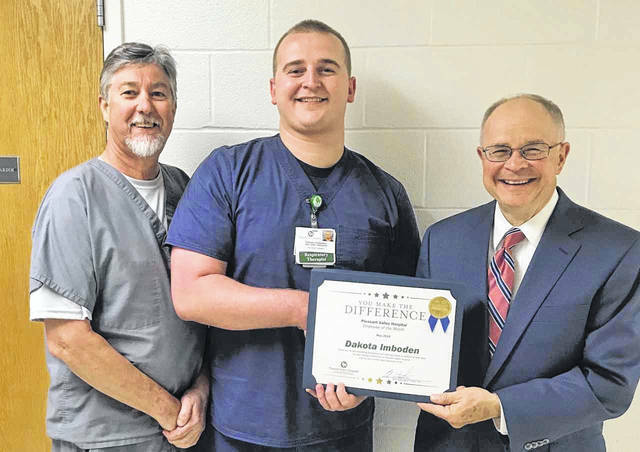 POINT PLEASANT, W.Va. — Pleasant Valley Hospital (PVH) announces the Customer Service Employee of the Month for May 2018 is Dakota Imboden. Imboden has been employed in our Cardio-Respiratory Therapy Department since February 2017 as a Registered Respiratory Therapist. The Employee of the Month at Pleasant Valley Hospital is nominated for taking extra steps to provide excellent customer service to our patients and family members at Pleasant Valley Hospital. Imboden was nominated for Employee of the Month by a fellow employee who witnessed him helping an elderly gentleman to a doctor’s office on the second floor. Not only did he assist the patient with directions, he also explained to the patient that if he needed additional assistance when he was ready to leave, that the patient could have someone call the front desk to receive help on his way out.